Like a child pleading for just one more story before bedtime, I persuaded Tom that we should visit Honing church at the end of a long day when we should have been heading back to Norwich station. Actually, Tom didn't take much convincing. 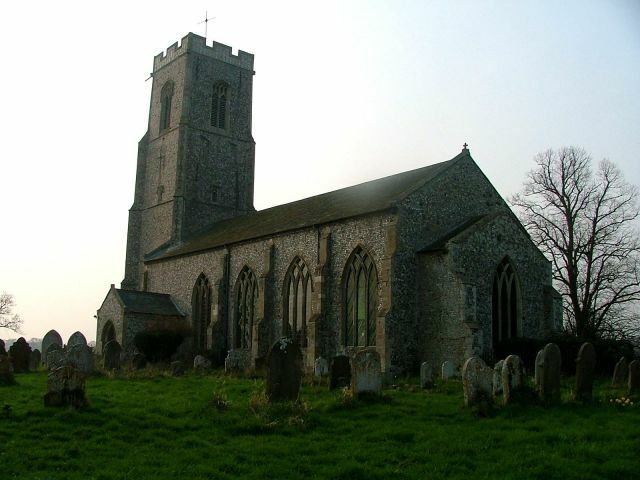 St Peter and St Paul is big, but it is not one of the most remarkable of Norfolk churches, so we knew it wouldn't take long. The approach here from the north is spectacular; we had come from ancient Crostwight in the rolling agricultural area south-west of Happisburgh. But Honing is quite different, an old Park with its Hall, and a long straight carriage drive now forming the public highway. For more than a mile it was lined with daffodils, which looked very cheery in early April, but I couldn't help wondering what they'll look like in a month's time, and again I pondered the wisdom of planting so many cultivated flowers in Norfolk hedgerows. That there is something not quite right about this building is obvious the moment you step into the beautiful graveyard from the east. The chancel has been almost entirely truncated, leaving barely eight feet like a lean-to against the nave wall. This makes the nave seem bigger than it is, and also creates a happy proportion with the fine tower. Something has happened here. Stepping into the wide, light nave, the curiosity continues. The aisles beyond the arcades seem so narrow as to be unlikely, and the walls beyond are obviously rebuilt. And then, look up - the roof extends from outer wall to outer wall, the arcades finishing uselessly up there in the gloom. 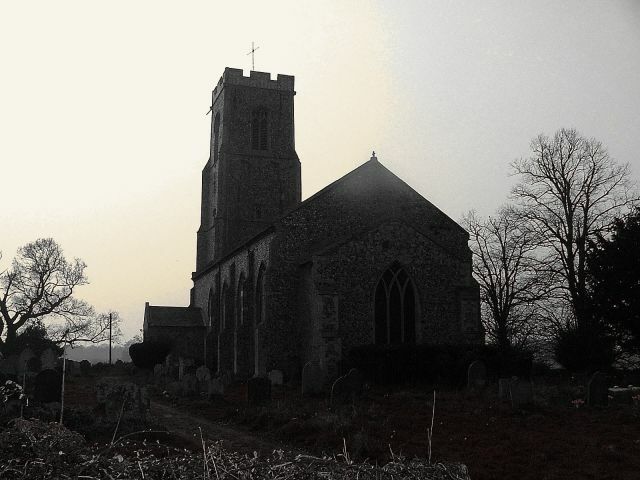 Obviously, this church underwent a fairly complete rebuilding at a time when churches were considered as preaching houses, and sacramental spaces were not a high priority - in fact, it was during the 18th century. Pevsner and Mortlock both thought it likely that the aisles were originally this narrow, and the new walls were built in the same places as the old - Pevsner points out that the medieval porch would have needed to be moved if the rebuilt walls had been drawn in. But I think that this is exactly what did happen, and I don't find the argument compelling at all. This was once a much wider church with arcades and aisles, and separate roofs to nave and aisles. Churches like this were often repaired by demolishing the aisles and infilling the arcades to make new walls. The fact that this is a Hall church makes me think that the local Lord was some sort of antiquarian, and enjoyed recreating what was still essentially a medieval space. He moved the walls in to make it possible to span the whole building in one roof, but left the arcades because, well, they are pretty. And the external structure still echoes what was there before, albeit not in an articulate 19th century way. He probably wanted a View as much as anything else. It isn't all successful - the filling in of the lower part of the west door to create a window is clumsy and ugly. 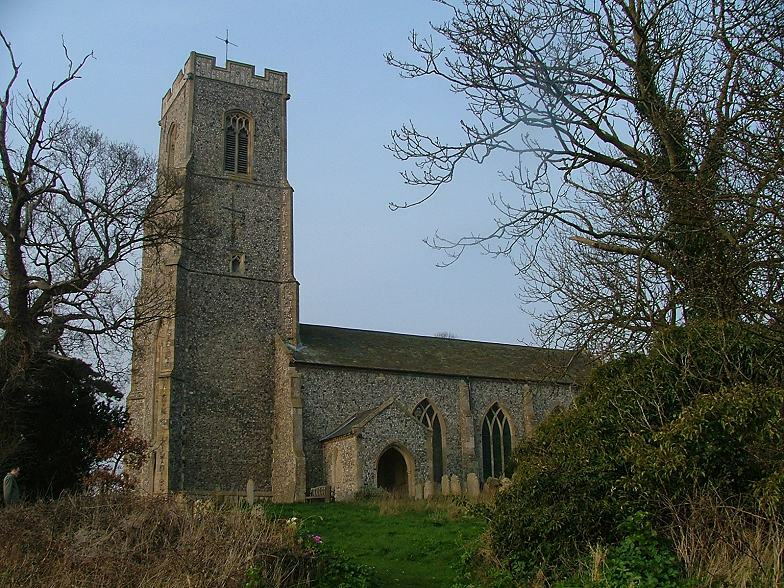 But otherwise it is a fascinating result, unlike any other church I've visited in Norfolk. There are hatchments, and a few medieval survivals - the font, a pretty figure brass in the choir. And this church is militantly open, bless it. But best of all is the setting - the graveyard drops away to the west, and across the fields a lonely, ancient pathway leads down to the village in the valley below. As it was, so it is.